The code in today’s post contains an “On Balance Volume” indicator for use in Backtrader that can be extracted and used in your own projects. On balance volume, or OBV for short is a volume based indicator that looks at close prices to arrive at a final calculation. Investopedia provides a nice little summary and historical background to the indicator. On-balance volume (OBV) is a momentum indicator that uses volume flow to predict changes in stock price. Joseph Granville first developed the OBV metric in the 1960s. He believed that when volume increases sharply without a significant change in the stock’s price, the price will eventually jump upward, and vice versa. On balance volume always builds on its own previous value. In other words, it is a cumulative indicator. If the close price increases, then volume is added to the previous indicator value. If the close price decreases volumeis subtracted from the previous indicator value. It should be noted that it compares the current close value with the close[-1] (previous close) and not the current open value vs current close value. This means that we can actually have a green candle day and still deduct volume. An example of this might be caused when price gaps down and closes up. If you are looking for strategy ideas, head over to stockcharts.com. The have an OBV article which gives some great tips on how to interpret the indicator, flag divergences and confirm Trends. # known as seed values. #Get Apple data from Quandl. In our Indicator, when nextstart()is called, we use a slightly different calculation. We just assign volume as a positive or negative value without adding it to the previous value. Why are the values different to platform xyz? The OHLC data may not be exactly the same. For example, one platform could show an asset closed slightly up whilst another data closed down or flat. More importantly, the values are cumulative. They build on the previous line. As such, the data on the two platforms must start on the exact same day to match properly. Having said that, we can get a general feel for whether we have garbage output. 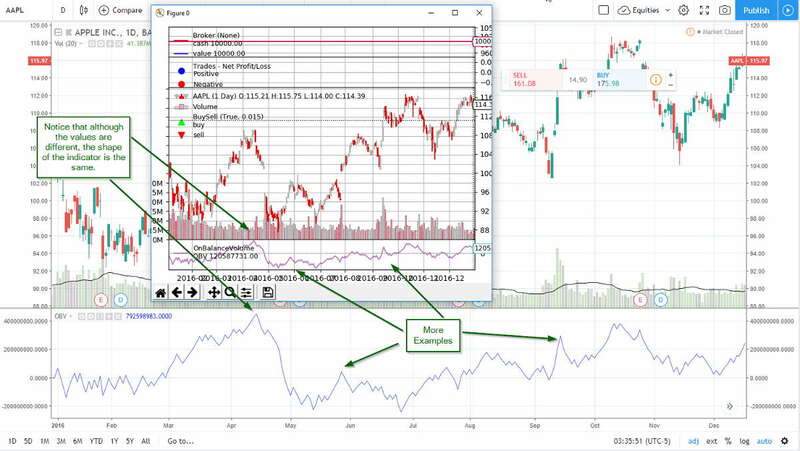 Take a look at the following comparison between the indicator and Tradingview. In the screenshot, we can see that although the values reported are different the form/shape of the lines match up quite nicely.